Turkish (Türkçe ), also referred to as Istanbul Turkish, is the most widely spoken of the Turkic languages, with around 10–15 million native speakers in Southeast Europe (mostly in East and Western Thrace) and 60–65 million native speakers in Western Asia (mostly in Anatolia). 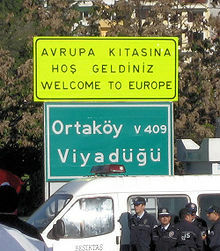 Outside of Turkey, significant smaller groups of speakers exist in Germany, Bulgaria, Macedonia, Northern Cyprus, Greece, the Caucasus, and other parts of Europe and Central Asia. 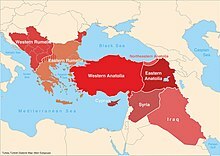 Cyprus has requested that the European Union add Turkish as an official EU language, even though Turkey is not a member state. Turkic languages belong to the Altaic language group. About 40% of all speakers of Turkic languages are native Turkish speakers.The characteristic features of Turkish, such as vowel harmony, agglutination, and lack of grammatical gender, are universal within the Turkic family. The Turkic family comprises some 30 living languages spoken across Eastern Europe, Central Asia, and Siberia. The phoneme that is usually referred to as yumuşak g ("soft g"), written ទំព័រគំរូ:Angle bracket in Turkish orthography, represents a vowel sequence or a rather weak bilabial approximant between rounded vowels, a weak palatal approximant between unrounded front vowels, and a vowel sequence elsewhere. It never occurs at the beginning of a word or a syllable, but always follows a vowel. When word-final or preceding another consonant, it lengthens the preceding vowel. Turkish orthography reflects final-obstruent devoicing, whereby a voiced obstruent, such as /b d dʒ ɡ/, is devoiced to [p t tʃ k] at the end of a word or before a consonant, but retains its voicing before a vowel. In loan words, the voiced equivalent of /k/ is /g/; in native words, it is /ğ/. The vowels of the Turkish language are, in their alphabetical order, ទំព័រគំរូ:Angle bracket, ទំព័រគំរូ:Angle bracket, ទំព័រគំរូ:Angle bracket, ទំព័រគំរូ:Angle bracket, ទំព័រគំរូ:Angle bracket, ទំព័រគំរូ:Angle bracket, ទំព័រគំរូ:Angle bracket, ទំព័រគំរូ:Angle bracket. The Turkish vowel system can be considered as being three-dimensional, where vowels are characterised by three features: front and back, rounded and unrounded and vowel height. [ត្រូវការអំណះអំណាង] In fact, the vowel ទំព័រគំរូ:Angle bracket, being the fronted version of ទំព័រគំរូ:Angle bracket, is often pronounced /æ/ (just like Azerbaijani ទំព័រគំរូ:Angle bracket). 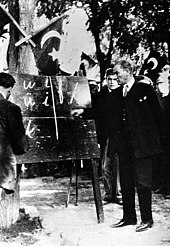 Vowel harmony is the principle by which a native Turkish word incorporates either exclusively back vowels (a, ı, o, and u) or exclusively front vowels (e, i, ö, and ü). [ត្រូវការបញ្ជាក់] The pattern of vowels is shown in the table above. Stress is usually on the last syllable. Exceptions include some suffix combinations and loanwords, particularly from Italian and Greek, as well as interjections, adverbs, and many proper names. While the aforementioned loanwords are usually stressed on the penultimate syllable ([ɫoˈkanta] lokanta "restaurant" or [isˈcele] iskele "quay"), the stress of proper names is less predictable ([isˈtanbuɫ] İstanbul, [ˈaŋkaɾa] Ankara) see Sezer stress. The extensive use of affixes can give rise to long words, e.g. Çekoslovakyalılaştıramadıklarımızdanmışsınızcasına, meaning "Just like you are said to be one of those that we couldn't manage to convert to a Czechoslovak". While this case is contrived, long words frequently occur in normal Turkish, as in this heading of a newspaper obituary column: Bayramlaşamadıklarımız (Bayram [festival]-Recipr-Impot-Partic-Plur-PossPl1; "Those of our number with whom we cannot exchange the season's greetings"). Another example can be seen in the final word of this heading of the online Turkish Spelling Guide (İmlâ Kılavuzu): Dilde birlik, ulusal birliğin vazgeçilemezlerindendir ("Unity in language is among the indispensables [dispense-Pass-Impot-Plur-PossS3-Abl-Copula] of national unity ~ Linguistic unity is a sine qua non of national unity"). ↑ "Transitivity in Turkish, A study of valence orientation". Okayama University. 2012. http://repository.tufs.ac.jp/bitstream/10108/73105/1/aall7_4.pdf. ↑ "Cyprus". Encyclopedia Britannica. 2016. https://www.britannica.com/place/Cyprus#toc33843. ↑ "Altaic Languages". Oxford Research Encyclopedias. 2016. http://linguistics.oxfordre.com/view/10.1093/acrefore/9780199384655.001.0001/acrefore-9780199384655-e-35. ↑ "Iraq". Encyclopedia Britannica. 2016. https://www.britannica.com/place/Iraq/Arabs#toc22939. ↑ "Kosovo". Encyclopedia Britannica. 2016. https://www.britannica.com/place/Kosovo#toc296713. ↑ The vowel represented by ទំព័រគំរូ:Angle bracket is also commonly transcribed as ទំព័រគំរូ:Angle bracket in linguistic literature. Cite error: <ref> tag with name "azerbaijan" defined in <references> is not used in prior text. Cite error: <ref> tag with name "greece" defined in <references> is not used in prior text.